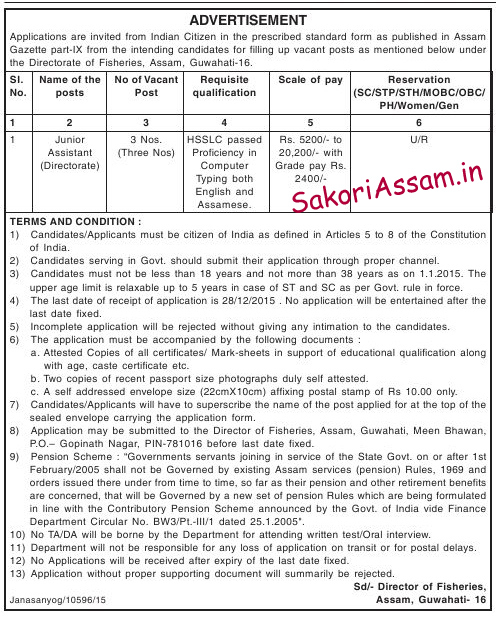 Applications are invited from Indian Citizen in prescribed standard form as published in Assam Gazette part-IX from the intending candidates for filling up vacant posts as mentioned below under the Directorate of Fisheries, Assam, Guwahati-16. The last date of application is 28th December, 2015. Age: 18 to 38 years as on 01-01-2015. The upper age limit is relaxable up to 5 years in case of ST and SC as per Govt. rule in force. Attested copies of all certificates/ Mark-sheets in support of educational qualification along with age, caste certificate etc. Two copies of recent passport size photographs duly self attested. A self addressed envelope size (22cm x 10cm) affixing postal stamp of Rs. 10.00 only. Application may be submitted to the Director of Fisheries, Assam, Guwahati, Meen Bhawan, P.O- Gopinath Nagar, Pin-781016 before last date fixed.